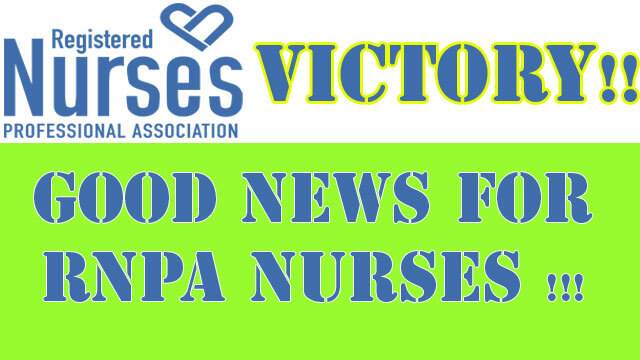 Victory for DEDICATED RNPA Nurses!!! In early May 2016, Kat Volpe, MICC RN was denied her vacation request to the code status she was working. In turn, she contacted RNPA and as a result, on May 26, 2017 RNPA filed a grievance on behalf of Ms. Volpe as well as any other affected nurse, and the entire Association. The specific nature of the grievance was that nurses in part-time codes (partial codes .5, .6, .8, .9) whom had consistently worked beyond their code status were being denied the ability to take vacation (PTO) to the code status that the nurse consistently worked. RNPA recently received a binding arbitration decision from Arbitrator Katherine Harris ruling that part-time RNs should have the ability to calendar vacations consistent with over code hours worked. What does this mean to partially coded nurses? If you are for example a .8 nurse and consistently work to full code status, when you request vacation, you can request vacation to full code status. This means as a .8 consistently working to full code status you can request 80 hours in a pay period verses 64 hours. If you are a .6 and work consistently to .8 status you can request 64 hours of vacation in a two-week period versus 48 hours.